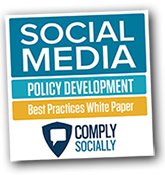 Use this free online resource by Eric Schwartzman to accelerate your social media policy development timeline. Over the last two years, nearly half of all employers have disciplined workers for social media misuse. 80% of employers have a social media policy, and 70% have taken disciplinary action against employees for social media misuse. Why is the rate of misuse so high? What are they doing wrong? Find out in this white paper by digital marketing and compliance specialist Eric Schwartzman. You’ll learn how social media policies are changing and receive the latest, exclusive case studies on how employers are handling digital and social media governance.